I have never been more tested than I was tested in my final year of graduate school. I knew pursuing a doctorate in biomedical sciences would be hard but it was difficult in ways I never could have predicted. Entering graduate school you think the science will be the hardest part. You are told that you will be challenged and that it is part of the growing process of becoming a scientist. This is true. My project challenged the existing dogma surrounding cancer metastasis and answering the questions required to make a complete story was difficult and exciting all at once. However, the hardest part of pursuing a doctorate is the waiting. In my last 10 months of graduate school I entered the realm of the unknown. On January 14, 2017 I married the love of my life in my home parish in Miami. On January 16th we boarded separate flights to our respective cities. He had been working in Boston for 6 months and I was still struggling to finish my PhD in Atlanta. We had promised each other that we would only be apart a year. That timeline was based upon when I believed I could complete my dissertation requirements. My husband and I exchanged these texts on April 27, 2017. The year-long timeline I had promised was drawing near. 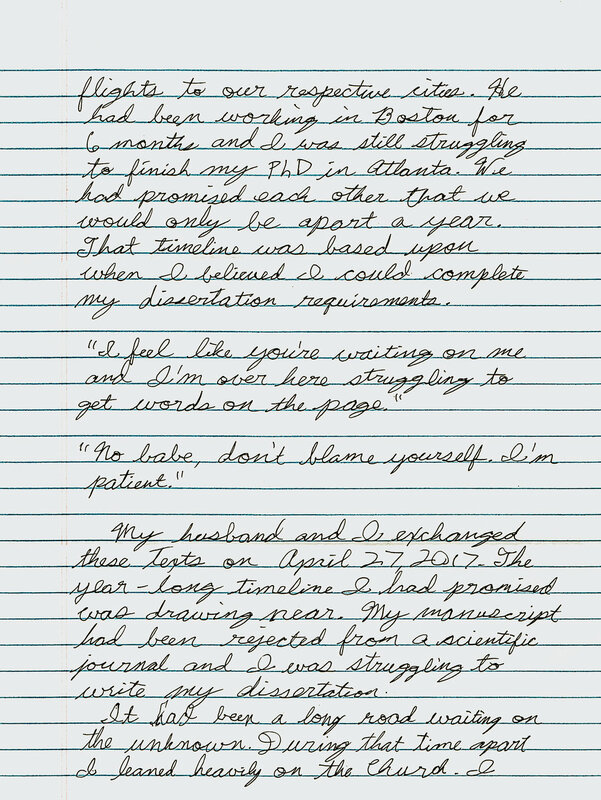 My manuscript had been rejected from a scientific journal and I was struggling to write my dissertation. It had been a long road waiting on the unknown. During that time apart I leaned heavily on the Church. I joined a JustFaith program (without realizing what kind of a commitment I had signed up for). I made church friends for the first time since high school. Through some twist of fate I found myself living in a condo my in-laws owned and commuted 40+ minutes to the lab every day. I never imagined myself a commuter. Around this time Lent began and I began to appreciate the gift of time I had been given. I tuned into The Catholic Feminist Podcast where I found kindred spirits. If somebody had told me 6 months prior that I would be commuting to grad school while listening to Catholic speakers and podcasts, I would have laughed outright. Slowly but surely I began to let go. I trusted that whatever daily torture I was feeling, it would reveal itself into some greater plan that I just couldn’t see yet. "Slowly but surely I began to let go." The road was long and arduous. Some days I could pretend this was a normal life. Other days I found myself crying to my husband on videochat over the latest setback in my “perfect graduation plan.” The plan that would convince my thesis committee that I had achieved all that they wanted and that I was “worthy” of the elusive doctorate degree. I discovered daily devotionals and prayed every day that God would show me the path out of this darkness. Then, without warning, I caught a glimmer of light. I had fought an uphill battle trying to graduate on the optimal timeline I had set for myself. As always happens, God had greater plans. I had heard this time and again growing up but it never truly set in until I had no choice but to depend on Him. Every time I tried to force graduation or publication of my manuscript, I hit a rejection, a brick wall. I slowly released my grip on the wheel and God’s plan went into cruise control. My husband, homesick for Georgia and me, applied for a job in Atlanta. He secured the position and like every other married couple, we went on our honeymoon and moved in together (6 months late) into a new apartment in the city. "As always happens, God had greater plans. I had heard this time and again growing up but it never truly set in until I had no choice but to depend on Him. Every time I tried to force graduation or publication of my manuscript, I hit a rejection, a brick wall. I slowly released my grip on the wheel and God’s plan went into cruise control." Having lost all hope in a summer graduation, my creativity came back and experiments I had tried time and again began to work! Finally, I reached out to a friend of a friend and applied for my dream job. Everything flowed perfectly at the interview and I received a call back the same day with a verbal offer. A mere 9 months after my husband and I said, “I do” my whole world had changed. I had someone to come home to, my manuscript was under revision, and I had a job lined up after graduation. I could not have planned a more perfect timeline and I didn’t need to. God had done it for me. Looking back it’s easy to see where God was leading me. Always toward him and toward the best life possible. However, in those daily moments it was near impossible to let go. Only with the strength He provided was I able to finally release control. "Looking back it’s easy to see where God was leading me. Always toward him and toward the best life possible." I pray that you will find peace in the unknown and that one day you too will see God’s plan for your life. My name is Alessandra Maria Richardson (neé Salgueiro). I am second generation Cuban-American and was raised Catholic in Miami. I am 28 years old and I live in the heart of Atlanta with my husband, Christopher. I just finished my PhD in Cancer Biology last Fall from Emory University and now work as a medical writer, creating communications on clinical trials for pharmaceutical companies. My hobbies include working out, trying new restaurants, and traveling to visit family and friends. 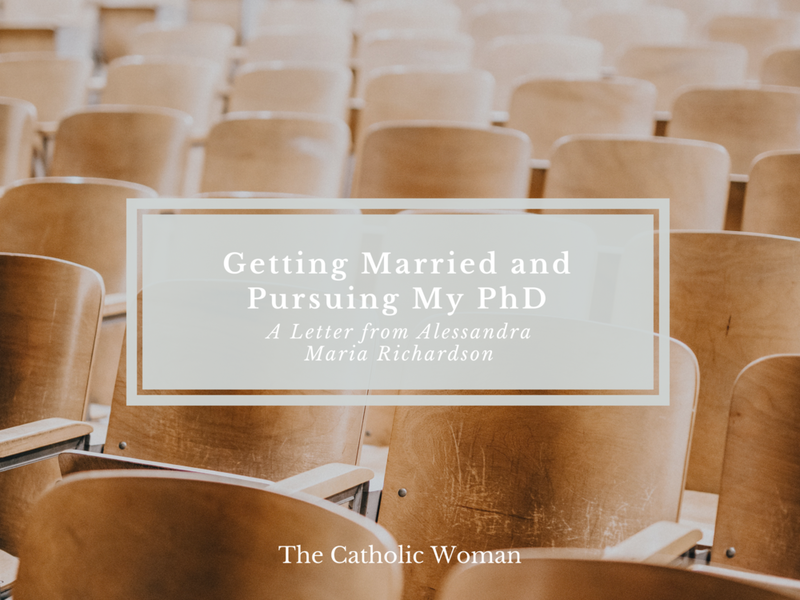 How did you discern that God was calling you both to marriage to graduate school? Discerning graduate school: Since I was 16 I knew I wanted to pursue a PhD. At that time my aunt and uncle were graduate students earning their PhDs in biochemistry (our family has weird age gaps). I first felt the pull in my AP biology class where cell biology fascinated me and the fact that cancer broke all of the rules of normal cell biology intrigued me even more. So I asked my aunt and uncle about graduate school and gained some lab experience. From then on I was hooked. Biology just clicked for me and cancer research seemed like the best way I could combine my aptitude for science with my desire to serve others. God opened the doors to the best undergraduate and graduate programs I could get into. The path to graduate school was very smooth and that's how I knew it was the right one. Discerning marriage was similar. My husband and I met my first year of graduate school in 2012. From our first date I felt things were different with him. Conversation was easy and I never wanted to stop spending time with him. Since my husband is not a practicing Catholic, I sought guidance from my grandmother as my grandfather also did not practice. She said as long as he was a good man and I did not expect or demand a conversion of heart, then we could have a healthy marriage. From that point he started to exhibit idiosyncrasies similar to my grandfather and I took them as signs that our relationship would work. Chris and I discussed marriage for a few years as our relationship went long-distance twice during his internships in California. In December 2015, while on vacation in Vienna, we decided it was time to get engaged. We knew he would graduate in May and since his career was uncertain at that point, we wanted to at least have our relationship be solidified before graduation. About 5 months into our engagement Chris graduated and moved to Boston for his first job. How did you navigate wedding planning while being a graduate student? While I had never been one of those girls who grew up with a wedding binder, I actually enjoyed wedding planning! Our wedding was in my hometown of Miami where my parents and most of my family still live. Since my parents were on location and in charge of the budget, planning went fairly smoothly. Once I had decided on a theme (travel), everything else fell into place. I used the checklist on the Knot and made sure everything was getting done as my parents did most of the legwork. As a graduate student my schedule was pretty flexible so I could travel for long weekends as needed to coordinate bridesmaid dresses, have a bachelorette party, and approve the venue. Since we got married in January, I was able to help with all last minute details while Chris and I visited Miami for Christmas. I was very fortunate that my parents handled many of the details to support me in my graduate studies and my long-distance engagement. What did your vocation as a wife look like for the first 6 months of your marriage on a day-to-day basis? What does it look like now, a year later? During the first 6 months of our marriage my husband and I were long distance as he was working in Boston and I was finishing my degree in Atlanta. We texted each other throughout the workday and at night we FaceTimed daily. Some days were fairly normal (this was our 3rd time being long-distance after all). 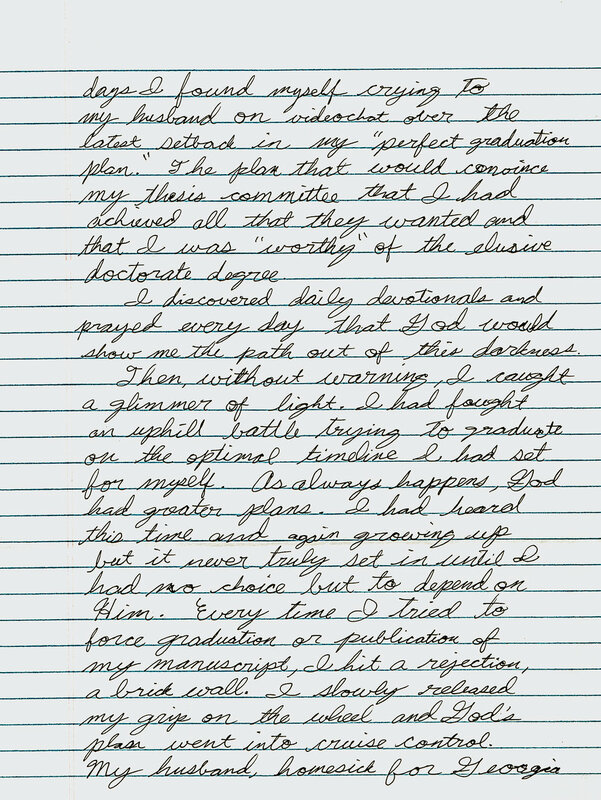 Others were more emotional as I would hit a setback in my graduate work or the burden of long-distance would settle in. Prior to our January wedding and while he was in Boston we saw each other about once a month. Once we were married the distance took a bigger toll and we increased our visits to twice a month. Typically he would fly me up as my schedule was more flexible and he had the bigger income. We each had our cross to bear during that time. Mine was that the length of our time apart was contingent on my graduating. His was that he had little social distraction as he had lived in the South his entire life and had few friends in Boston. As I state in my letter, Chris was endlessly patient during this time as he always insisted I put my dissertation first and graduate with a body of work I could be proud of. 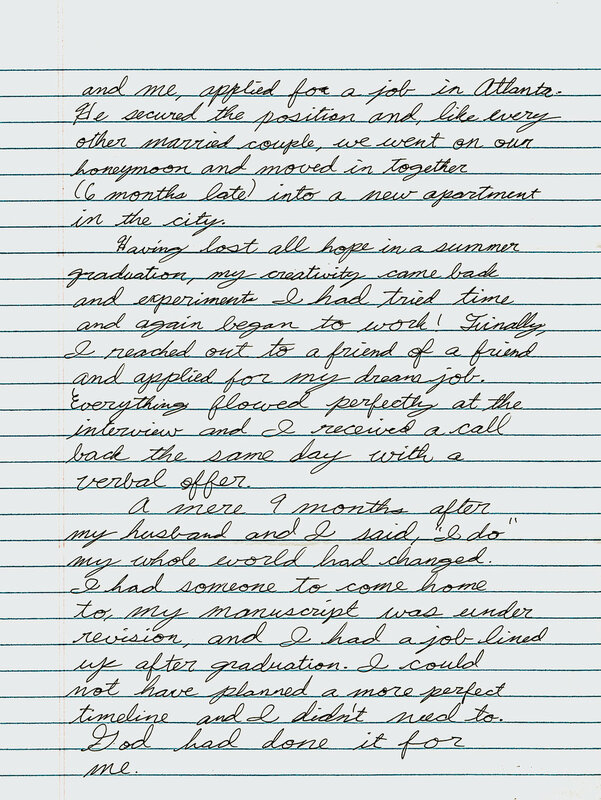 However, under the surface he was homesick as was revealed by his application to a job in Atlanta. Now, over a year into our marriage our daily routine looks completely different. We live together (like a normal married couple) in Atlanta! We typically have breakfast together before he walks and I take the train to work. At the end of the day we might cook together or hang out with friends in the neighborhood. We can actually plan for our future together now that we know we will always live together. We no longer feel spread across 3 cities: Boston (where he was living), Atlanta (where his family and I lived), and Miami (where my family lives). To the woman who wants to get married and pursue higher education at the same time, what advice would you lend to her? To the woman who wants to get married and pursue higher education: just do it. I knew people in graduate school who put their lives on hold while they pursued their degrees. I never understood that. School has always been supremely important to me but so is having a life. While I was never actively chasing down husband-material throughout my education, I never stopped being open to the idea of a relationship. I try to live my life by the famous Ferris Bueller quote: Life moves pretty fast. If you don't stop and look around once in a while, you might miss it. Easter. So Easter. I feel Mass is much more emphasized during Easter than at Christmas and I have always loved that. It has also become my holiday to host among in-laws as I remain the only practicing Catholic and I enjoy sharing that with them. joy after Lent! So much beauty out of suffering. Saint Catherine of Siena. She is the patron saint of my home parish in Miami and influenced the church through her writings. I hope to influence people with my writings as well (scientific and non-scientific). drinking my cafe con leche and reading daily devotionals on the couch before work.